Don't let a mechanical breakdown hinder your fitness plan. 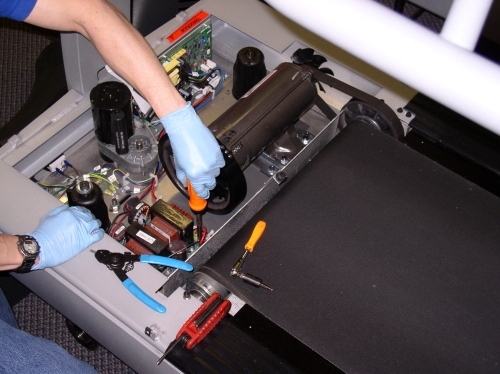 Our technicians are experts when it comes to treadmill repair issues and the mechanical quirks of most make and models. Make FS Fitness Solutions in Kingston your first call when you are in need of reliable exercise equipment repair services, including unexpected treadmill repairs, exercise bike repair and elliptical repair service calls. Our trained treadmill repair technicians provide in-home service on almost any make and style of treadmill. When it comes to treadmill repair parts, including straightforward treadmill belt repair or complicated treadmill motor repair jobs, you can count on Fitness Solutions to do it take care of your needs. Our treadmill repair experts are trained to identify problems, provide you with a detailed quote that includes high-quality parts and technical expertise. You have our assurance that our FitCare Guarantee backs the treadmill repair task you entrust to us. Contact Fitness Solutions Kingston today to book a convenient appointment for service by a qualified treadmill repair expert. The above are performed depending on type of product to be serviced. Not all of the above may apply to your machine. Exercise equipment preventive maintenance is should be performed about once a year for units that is in residential use. When you are ready to schedule an appointment or for more information simply e-mail us your address, make and model and we will contact you to confirm an appointment.